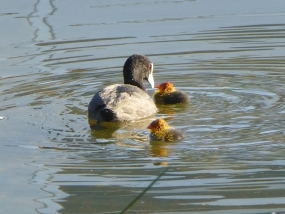 Meaning of name: Fulica is Latin for coot. Atra is derived from the Latin word ater, meaning black. Distribution: Found across most of Australia but largely absent from the eastern parts of Western Australia. 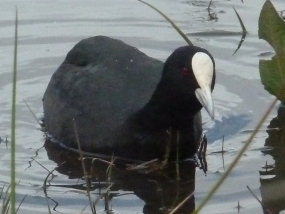 The Eurasian Coot is also found throughout Europe and Asia. Description: The Eurasian Coot can be up to 39cm long with a 64cm wingspan. Notes: The furthest distance recorded by the Australian Bird and Bat Banding Scheme for this species of bird to travel is 797km. 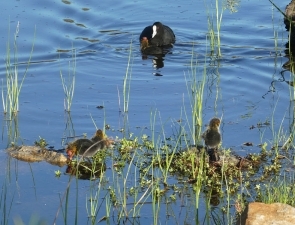 The oldest bird recorded was still alive when its band was read in February 1973, 7 years 2 months after being banded (information as at 15 June 2012). 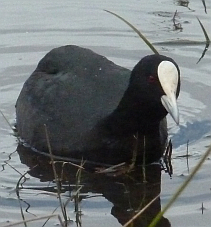 The large white frontal shield is the Eurasian Coot's most distinctive feature. 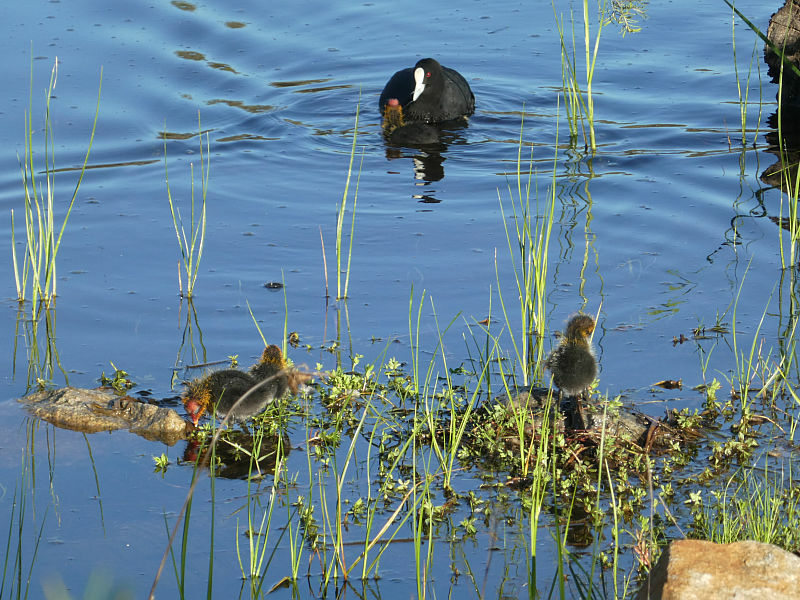 This young Eurasian Coot is being fed by a parent while its siblings wait their turn. 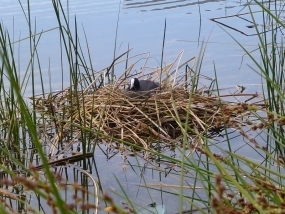 This Eurasian Coot is sitting on its nest. This photograph was not taken in the reserves of interest to the FQPB. 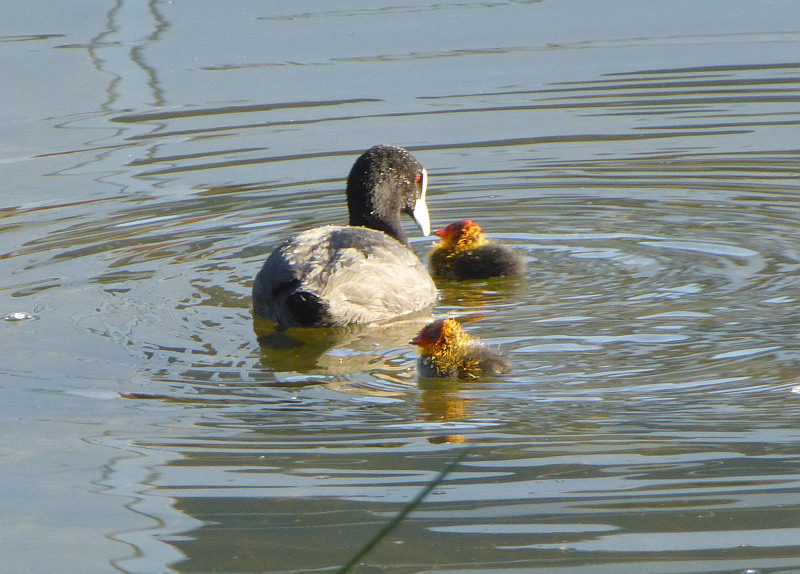 These young Eurasian Coots are only a few days old. This photograph was not taken in the reserves of interest to the FQPB.